One of the few strictly metrical hymns in the Jewish liturgy, the nobility of the diction of which and the smoothness of whose versification have given it unusual importance. According to the custom of the Sephardim and in British synagogues generally, it is congregationally sung at the close of the Sabbath and festival morning services, and among the Ashkenazim also it often takes the place of the hymn Yigdal at the close of the evening service on these occasions, while both hymns are almost universally chanted on the Eve of Atonement. Because of this solemn association, and on account of its opening and closing sentiments, the hymn has also been selected for reading in the chamber of the dying. It is likewise printed at the commencement of the daily morning prayer, that its utterance may help to attune the mind of the worshiper to reverential awe. In the Sephardic version the hymn comprises six stanzas of two verses each, but the fourth (which is but an amplification of the third) is omitted by the Ashkenazim. For so wide-spread and beloved a hymn, the traditional tunes are singularly few. Only four or five of them deserve to be called traditional. Of these the oldest appears to be a short melody of Spanish origin (see A below). 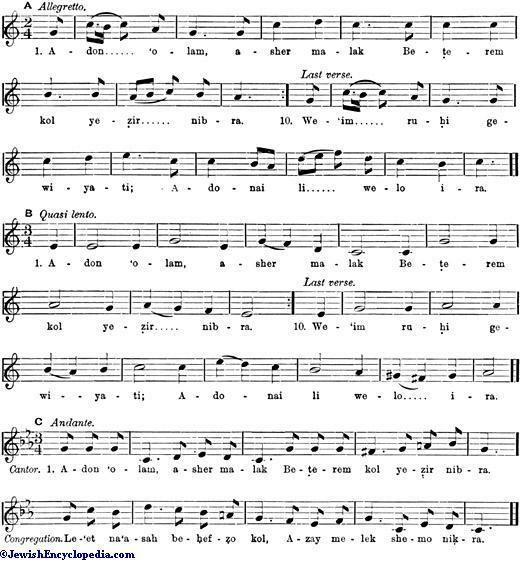 Of similar construction is a melody of northern origin associated by English Jews with the penitential season (see B below). This melody is often sung antiphonally, between precentor and congregation, although it was obviously intended for congregational rendering only, like the Spanish tune given above it. The best known of the other traditional antiphonal settings exists in two or three forms, the oldest of which appears to be the one given below (C). Every one of the synagogal composers of the nineteenth century has written several settings for "Adon 'Olam." Most of them—following the earlier practise of the continental synagogues during the modern period (see Choir)—have attempted more or less elaborately polyphonic compositions. But the absurdity of treating an essentially congregational hymn so as to render congregational singing of it impossible is latterly becoming recognized, and many tunes in true hymn form have been more recently composed. Special mention should be made of the setting written by Simon W. Waley (1827-76) for the West London Synagogue, which has become a classic among the British Jews, having been long ago adopted from the "reform" into the "orthodox" congregations, of England and her colonies. It is here excerpted from the music-book of that synagogue by the wardens' kind permission (see D below). 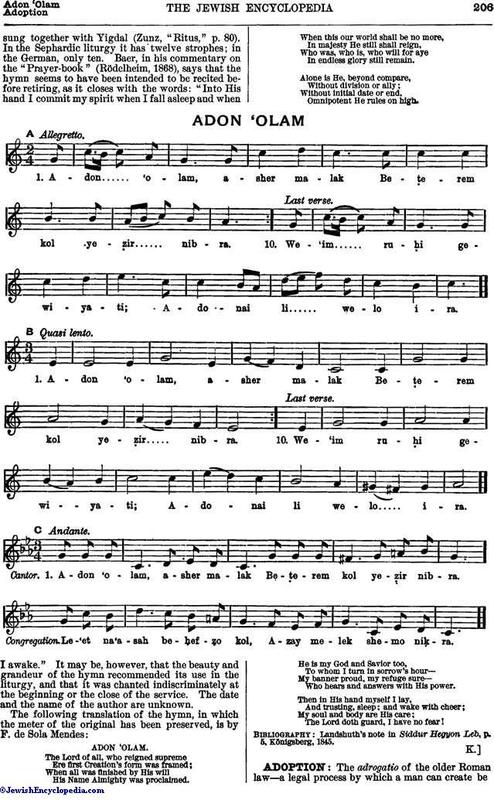 The Adon 'Olam is one of the most familiar hymns in the whole range of the Jewish liturgy, employed in the various rituals all over the world, though not always at the same period of the service or on the same occasions; thus in the Roman Maḥzor it is placed at the end of the Sabbath service andsung together with Yigdal (Zunz, "Ritus," p. 80). In the Sephardic liturgy it has twelve strophes; in the German, only ten. Baer, in his commentary on the "Prayer-book" (Rödelheim, 1868), says that the hymn seems to have been intended to be recited before retiring, as it closes with the words: "Into His hand I commit my spirit when I fall asleep and when I awake." It may be, however, that the beauty and grandeur of the hymn recommended its use in the liturgy, and that it was chanted indiscriminately at the beginning or the close of the service. The date and the name of the author are unknown. The Lord of all, who reigned supreme Ere first Creation's form was framed; When all was finished by His will His Name Almighty was proclaimed. When this our world shall be no more, In majesty He still shall reign, Who was, who is, who will for aye In endless glory still remain. Alone is He, beyond compare, Without division or ally; Without initial date or end, Omnipotent He rules on high. He is my God and Savior too, To whom I turn in sorrow's hour—My banner proud, my refuge sure—Who hears and answers with His power. Then in His hand myself I lay, And trusting, sleep; and wake with cheer; My soul and body are His care; The Lord doth guard, I have no fear! 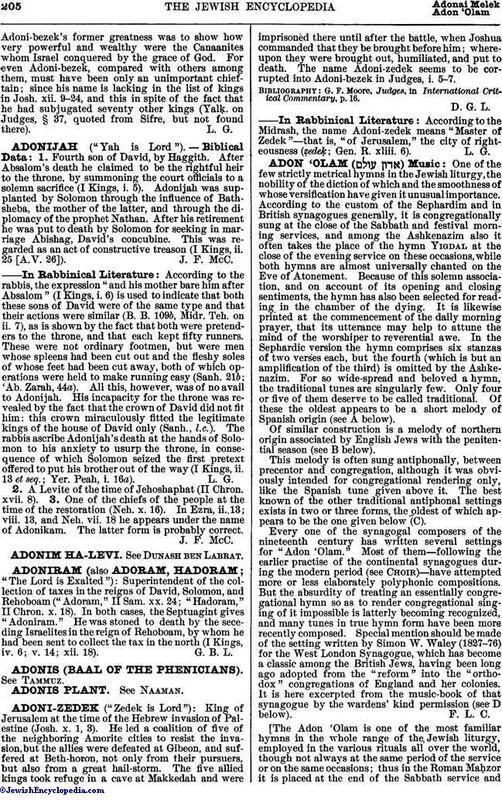 Landshuth's note in Siddur Hegyon Leb, p. 5, Königsberg, 1845.